It is no secret that I love to cook. My main reason for cooking is that I love to eat feed people. But the thing is that I’m a cheap cook. I typically like to scavenge my cabinets for what we already have in order to come up with a meal. Don’t get me wrong, I keep my pantry well stocked so that I have plenty of options. However, part of the fun is coming up with new things to cook based on what I have on hand. So when I read recipes with ingredients I do not have or expensive cuts of meat or out of season ingredients, I typically don’t make it. But lately, I have been wanting to work on certain “cooking school” basic techniques. This means that I actually need to study master recipes and stock up on ingredients specific to that meal. And who better to learn basic cooking techniques from than the master herself…Julia. Yes, Julia Child and her fabulous “Mastering the Art of French Cooking” series are the best assets to any home cook wanting to improve their skills. My husband bought me the set for Christmas!!! 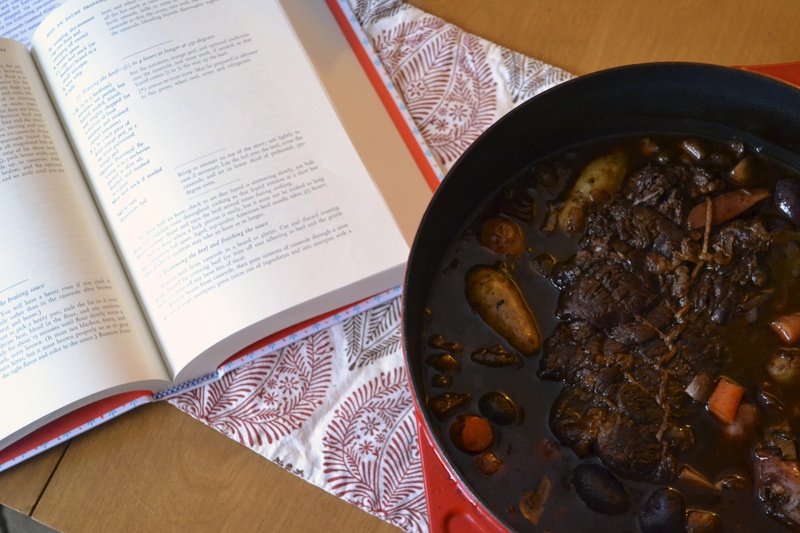 I have been wanting to master Julia’s basic braised beef pot roast recipe (Boeuf En Daube A La Provencale). 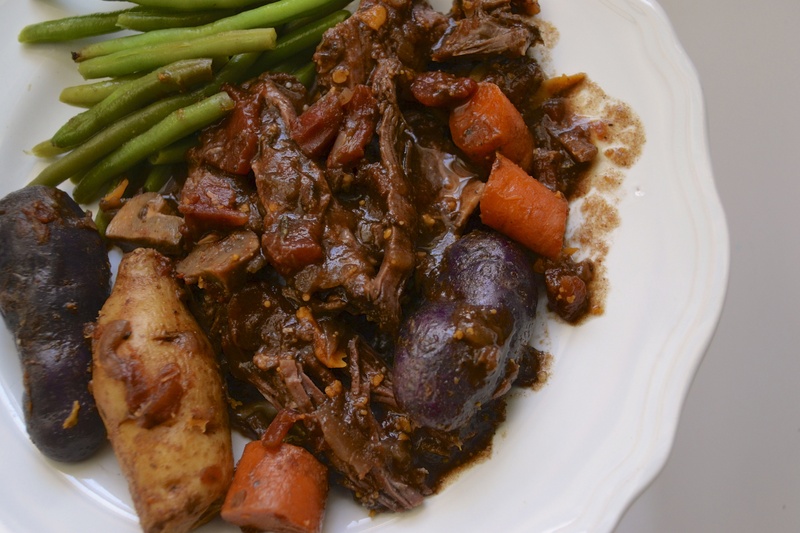 It is basically the love child of Beef Bourgingone and the best pot roast you can imagine. Comfort food at its best. 5 or 6-quart dutch oven with a tight fitting lid. I adapted the original recipe to a 2.5 lb roast (instead of a 6 pounder) and did not use flour in the roux to make it gluten free. Julia would gasp, but the sauce at the end was still magnificent and thick even though it was not thickened with a flour roux. This really was the BEST roast I have ever eaten. And although I didn’t follow Julia’s recipe to a T (tisk tisk), it was stunning. So I get a big fat F for setting out to “master” basic techniques not actually “following” that said recipe…but GAH…some of those steps just seem extraneous. Seriously….using beef knuckles to flavor my sauce? Julia…come ON! It has a bottle of wine and bacon grease! IT HAS FLAVOR! So maybe I will never be a master chef, but dang it…my family is well fed! Julia’s Notes – If you want to serve this roast the day you cook it, allow 5 hours from the moment you put the roast into the oven to the moment you will be serving it. Cooking time is dependent on the type and quality of the meat. There are several cuts of beef that work for braising: top round, chuck roast, shoulder/arm roast, bottom round or eye or round, sirloin tip, or middle of brisket. Have your butcher trim and tie the roast tight with twine. Make-Ahead Notes – This is a great dish to make for a crowd because the braised beef can be made ahead of time (up to a day or two in advance), with the flavors improving each day. To make ahead, prepare the dish through the oven-braising (Step 5). Allow the dish to cool to room temperature, then cover and refrigerate for up to three days. To serve, gently reheat the roast in the pot until the juices are once again liquified. Transfer the meat and vegetables to a baking dish, moisten with some of the juices, cover, and heat in a 325°F oven until warmed through. While the meat and vegetables are warming, proceed with Step 6 as directed below to make a sauce from the juices. Preheat oven to 300F. Set a rack on the lower third of the oven. Herb Bouquet – To make the herb bouquet, cut a large single-layer square of cheesecloth and rinse it to remove any loose fibers. Spread the cheesecloth flat and add to the center the smashed garlic, thyme sprigs, bay leaves, peppercorns, dried herbs, and orange zest. Gather the edges to form a pouch and tie tightly with kitchen twine. Set aside. 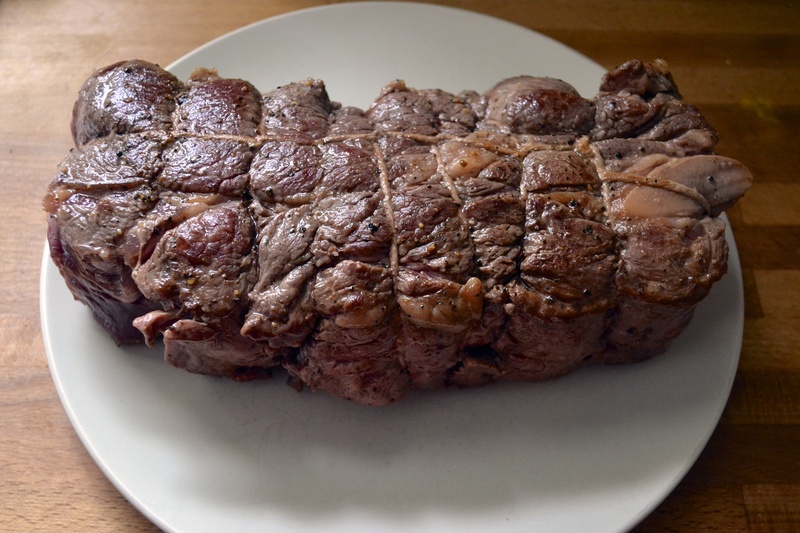 Searing the Beef – Pat the roast dry with paper towels and season with salt and pepper. In a 5- to 6-quart Dutch oven with a tight-fitting lid, heat the bacon grease (or olive oil) over medium-high heat. Brown the well-dried meat thoroughly on all sides and ends, lifting and turning with tongs and using the trussing strings. This should take about 5 minutes per side or about 10 minutes total. The meat should sizzle but not scorch; adjust the heat accordingly. Add more fat or oil if needed. When browned, transfer the meat to a large plate. Set aside. Preparing the Braising Liquid – Lower the heat to medium, add the onions and cook until they start to soften, about 5 minutes. Add the red wine, balsamic vinegar, beef broth, and the cheesecloth pouch of herbs. Bring to a simmer and scrape with a wooden spoon to dislodge all coagulated bits of brown flavor into the liquid. Return the meat to the pot, along any juices that have accumulated. Stir the tomatoes and more stock, if needed, so that the liquid comes to 2/3 of the way up the beef. Bring the liquid to a simmer on top of the stove. Braising the Beef – Cover the beef and the pot with a sheet of foil, pushing the foil down so it touches the meat. Set the lid in place. Slide the pot into the lower third of the preheated oven and cook for 2 hours, turning the roast with tongs after 1 hour. Check to make sure that the liquid in the pot is simmering slowly, not bubbling fast: regulate oven throughout cooking so that the liquid remains at a slow but definite simmer. After two hours, turn the roast over once more and baste. Then, scatter the carrots, potatoes, and mushrooms into the braising liquid around the roast. Recover the pot with foil, making sure that it touches the meat, and the lid. Place back into the oven and continue braising, covered with the foil and the lid, until the meat is fork-tender, about an hour longer. Test for doneness by spearing the meat toward the center with a carving fork. Pull out the fork carefully: If it lifts the meat along with it, continue cooking for another 20 to 30 minutes. According to Julia, for good quality American beef, the entire cooking process generally takes 3 1/2 hours. Other grades or qualities may take longer. 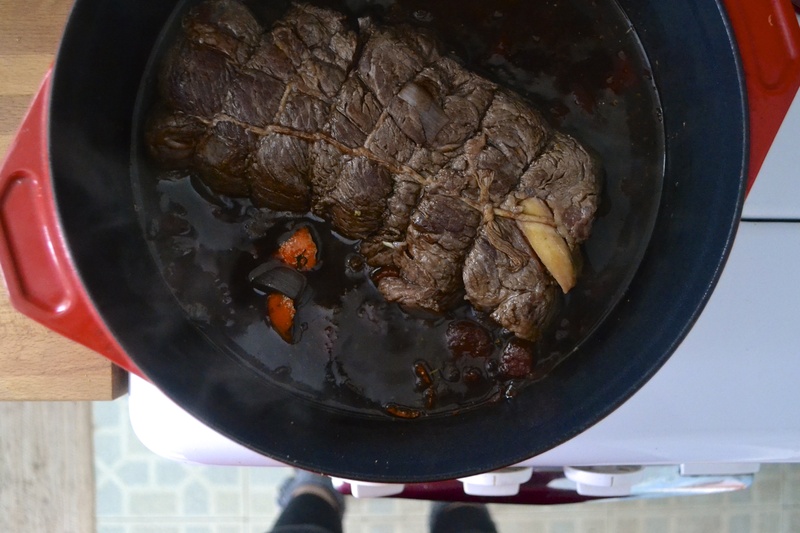 Making the Sauce – Transfer the pot roast and vegetables to a shallow platter and place a tent of foil over it. Strain the remaining liquid into a measuring cup, discarding the spent onion and the cheesecloth herb bouquet. Spoon off any fat that rises to the surface. Wipe out the dutch oven with a paper towel. Return the strained juices to the pot and bring to a simmer over medium heat. If the flavor seems weak, simmer the sauce vigorously over medium-high heat for 5 to 15 minutes to reduce the volume and concentrate the flavor. Season the thickened sauce with salt and pepper to taste. Whisk in the chopped parsley and capers. Serving – Julia says to cut the twine from the pot roast and carve the meat across the grain into 1/4- to 1/2-inch-thick slices. I like mine to fall apart in large chucks, but that’s just me. For family serving, arrange the meat on a serving platter and place vegetables around it. Ladle about half the sauce over all, and serve. Retain the remaining sauce in a gravy boat and pass around the table to drink pour on top.